Note: You can enter this giveaway three (3) times per e-mail address per day. Deadline is 11:59PM ET 11.24.17. Eat all your favorite fried foods with a lot less guilt. Yes, you read that right. 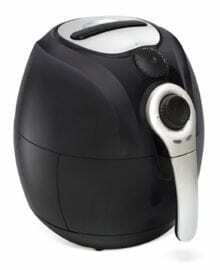 The Simple Chef Air Fryer lets you “fry” at home quickly, easily, and with little to no oil. It’s perfect for making Beach Fries on winter days, Inside-Out Sweet Potatoes for Thanksgiving, chicken, and much more. Easy-to-use temperature controls allow you to control the heat from 180 degrees to 400 degrees Fahrenheit depending on your needs and its 30-minute timer ensures you don’t overcook your food. The non-stick basket and pan are dishwasher-safe and make for easy clean-up, so not only can you eat guilt-free but you can cook mess-free as well. NO PURCHASE NECESSARY TO ENTER OR WIN. Void where prohibited by law. Open to legal residents of the 50 U.S., D.C. and Canada (excluding Quebec) who are at least eighteen years old at the time of entry and have internet access. Begins on 9.29.17 at 12:00:00 a.m. ET and ends on 11.24.17 at 11:59:59 p.m. ET. To enter the giveaway, submit your full name and email address on this form. Odds of winning this giveaway depend on the total number of eligible entries received. Only three (3) entries per email address per day. Sponsored by Leite’s Culinaria, Inc. For more information, visit our Official Rules. For a list of winners, check out our Very Happy Winners page. Be sure to add giveaways@leitesculinaria.com to ensure notification if you are the winner.